I read reviews of Sam Lee’s Faded in Time and they were ecstatic, so decided to give it a shot. I found the album intriguing earlier this year. It was definitely not background music, it demanded full attention. Like Jon Boden and Fay Hield, I feel that Sam Lee does more than simply “collect” traditional songs. He bends and adjusts the melodies, finds an angle, a personal slant and style with the material. I’d put the album to one side after a couple of months, then saw the concert advertised and decided to go … after all “live” is a full attention situation. It was an evening of impeccable sound, playing and vocals. The Studio at Poole sounds good anyway, but apparently it was Sam Lee & Friends first gig with a new mixing desk. It worked. The sound is entrancing, eerie, ever-changing with unusual instrumentation like the Mongolian dulcimer, the Jews harp, an amplified calabash for percussion, and a large slim deep bass-sounding drum in the snare position, like a bhodran. It was played alternating with bass tom-tom, and was hypnotic. Flora Curzon’s violin is the consistently dominant instrument throughout (and I note they list it as violin, rather than the folkier ‘fiddle.’). John Whitten’s multi instrumental abilities are outstanding. There were outstanding moments. The Jew’s Garden had twin Jews harps, a very unusual sound. It’s credited to Sam Lee, and it’s a rewrite of a 900 year old tale, which dates back to Medieval persecutions and blood libels. It’s updated with noted contemporary relevance. Sam Lee was intent on the instrument being a Jews harp, NOT a jaw harp (as it is often rendered). He pointed out that versions exist on al five continents. He also said it was not connected to the Jewish people. Because American albums always prefer to list ‘jaw(s) harp’ I checked the etymology. Apparently the ‘jaw’ or ‘jeu’ (from French ‘play’) versions are baseless. According to Wiki, it might be because Jews imported them into England. I suspect it’s a mildly pejorative use, dating back centuries, because it was cheap. Rather like Welsh Rarebit for cheese on toast, which is a politer version of Welsh Rabbit, because originally it was thought all the Welsh could afford … cheese not rabbit. The gorgeous Moss House opening the second half was simply Sam Lee on vocals, with John Whitten on grand piano. That reminded me of The Unthanks, where Adrian McNally’s piano is often to the fore. The strict discipline days of 60s folk with Peter Bellamy and The Young Tradition eschewed piano, but from the early 19th century on (at least) most pubs would have had one. It should be a “folk” instrument … of course we could go into a long discussion on fixed pitch instruments like pianos versus the elided notes of English, Irish and Scottish folk! Phoenix Island with added background vocals, reminded me very much of The Unthanks excursions into that folk / prog borderline. There’s a YouTube version with a larger band linked HERE. Blackbird was a change of pace, far jollier than most of the set with strong percussion. 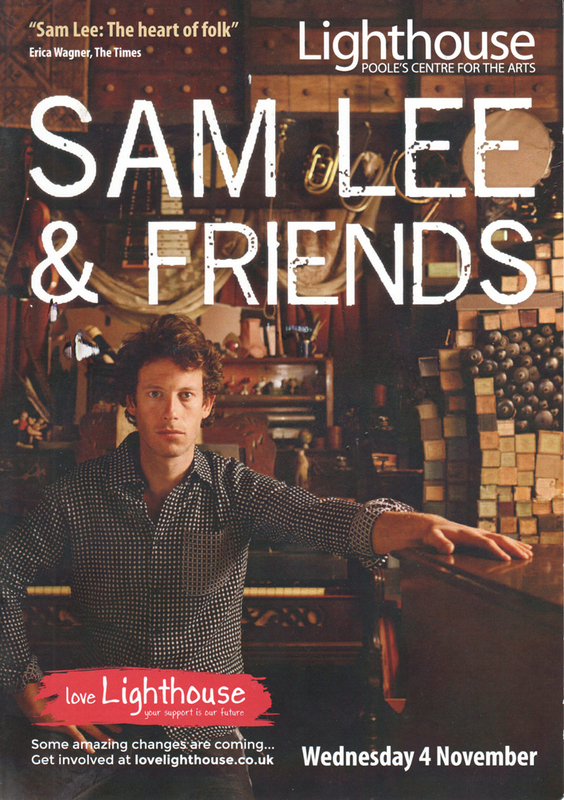 The touring 4-piece “Sam Lee & Friends” don’t have the trumpet and cello of the album The Fade In Time (and I loved the trumpet work on the CD) but live, I didn’t feel a sense of anything missing. Throughout, Sam Lee explained the various sources of the songs … mostly from singing Romany travellers, many of whom have passed on. He declines to sing the last verse of the haunting The Moon Shone On My Bed Last Night because the song was given to him by his mentor, Stanley Robertson, just before he passed on, who had in turn learned it from his aunt, Jeannie Robertson just before she passed on. So he’s saving the last verse … until it’s time to pass it on. Among many magic moments, Lovely Molly leaps out. Sam, Flora and John walked in front of the mics, and sung it totally unaccompanied in three part harmony. There is something indefinable that happens when you sing unamplified, even when the amplification is as good as it was here. There’s a great version of the song in rehearsal at The Roundhouse on You Tube (LINKED). The only negative was the size of the audience, around thirty. It would have looked OK in a fifty seater folk club, but the capacity of The Studio is 130, leaving 100 empty seats. The group worked through it and gave a tremendous performance, but I know from lecture tours that the sudden smaller audience is quite dispiriting (though we were all extremely enthusiastic). It’s partly the problem of an Arts Centre (with few folk gigs) versus a folk club. There isn’t a core regular folk audience. I’d compare Forest Arts in New Milton, which has been full when I’ve been to folk there in spite of being in a much., much smaller town … or possibly because of being in a much smaller town. I often found on ELT tours that you’d get 200-300 people along in a smaller town, then only 15-20 in the capital city. Anyway, those who missed it are the unfortunate ones. We happy few were privileged. The tour continues to Calstock, Falmouth, Bristol and London. Of course I left with a copy of the earlier album, Ground of Its Own.